Great writing prompt review of the kindergarten standards for beginning first grade students! Students will write their own completed sentences with kindergarten sight words as starters and finish off by drawing and coloring an illustration. Each page has a writing prompt, like a puzzle, because they lack capitals and spaces--a quick realization to how important they are to reading a sentence! 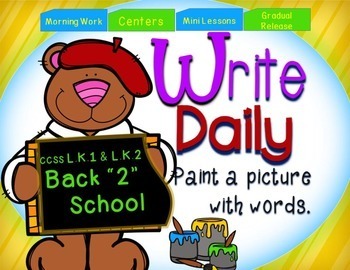 Write Daily Book Back "2" School is for the first 2 weeks of the school year, which usually a time devoted to learning the rules and getting back into the groove of school. Each week has 5 sentences related to the kindergarten CCSS language strand, focusing on writing complete sentences with capital and lowercase letters, spacing / spaces between words and punctuation. This is great for end of year kindergarten (ages 5-6), all first grade (ages 6-7) and remedial second grade (ages 7-8) students! Primary students need lots of writing practice to not only write complete sentences but also vary their wording. Teach as mini lessons at the beginning and move to individualized morning work or centers for independent writing. 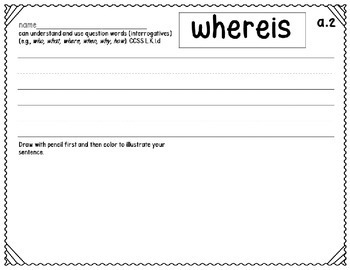 Great to use as formative or summative assessments in guided reading or writing workshop! 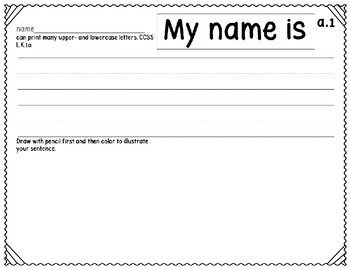 A general handwriting lines page may be printed on the back of each worksheet if preferred. Common Core (CCSS) listed on every page for students and parents to see the focused skill being reviewed from kindergarten. 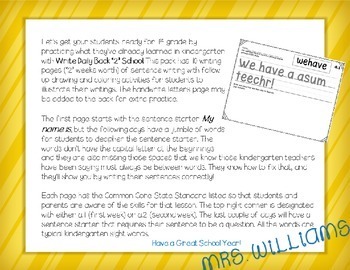 Get your students to write daily with daily practice! With Write Daily resources, watch your students improve their writing from simple sentences to more complex sentences with daily practice. No prep! Just print and go!